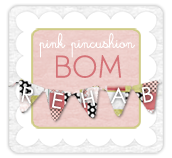 There are a myriad of wonderful reasons for maintaining a blog, connecting with like minded quilters, making new friends, sharing ideas, and participating in sew alongs are just a few. But this time of year my favorite reason to maintain a blog is the record it provides me when I go back and reflect on what I accomplished throughout the year. I finished 24 quilt tops in 2014, my unofficial goal is 12, one per month. I don't like to work on a project for longer than a month, I fall out of love with it if I do, I didn't have that problem this year. My first finish was Lifetime Quilt #123, Starlight, and it was a UFO, so that made that finish even sweeter. My last quilt of the year, #147, was Christmas Garden Lattice, I ended the year as happily as I started it. One of my yearly goals is to make a new basket quilt. I started the year thinking I would make Petit Fours or Sweet Caroline, both by Fig Tree, but I made Harvey, #141, instead. 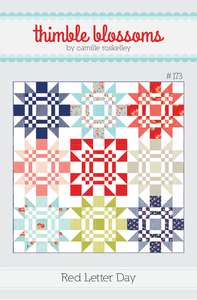 I also had several Miss Rosie's Quilt Co patterns on my radar at the beginning of the year, Toulouse, Scarlett Queen, Due South, and Brown Eyed Girl. I didn't get to a single one. But I did piece some other Miss Rosie's patterns like Hook, Not Quite Gertie, Lucy, Harvey, Zoom, Freddy, Crop Circles , Slice, and Jersey Girl. I was hoping to make a pattern from American Jane this year and I looked at them all year long but never started one, didn't even come close to starting one, maybe this year. There were a couple of other quilts I was hoping to get to but didn't, but there were some quilts that I hoped to make that I did finish. I started the year with 6 UFOs, I'm ending with 3. I did finish Dresden Doilies, Red and White Pineapple, and Starlight, and I'm still wanting to finish Clown Pants, but Mini Basket and Mini Red Churn Dash found new homes. So that got me down to 1, but I didn't finish Autumn Woods or Spell it with Moda for Christmas which pushes me up to 3. I don't have high hopes for Autumn Woods and in my mind I'm looking at my Spell it with Moda for Christmas project as a jump start on my 2015 Christmas quilt and not a UFO, but I'll count it. To see all the quilts I finished this year or for any details, go to my Lifetime Quilt List tab, I can't pick a favorite but maybe you can. I started 23 quilts, finished 3 UFOs and did not finish 2 projects which gets me to 24. 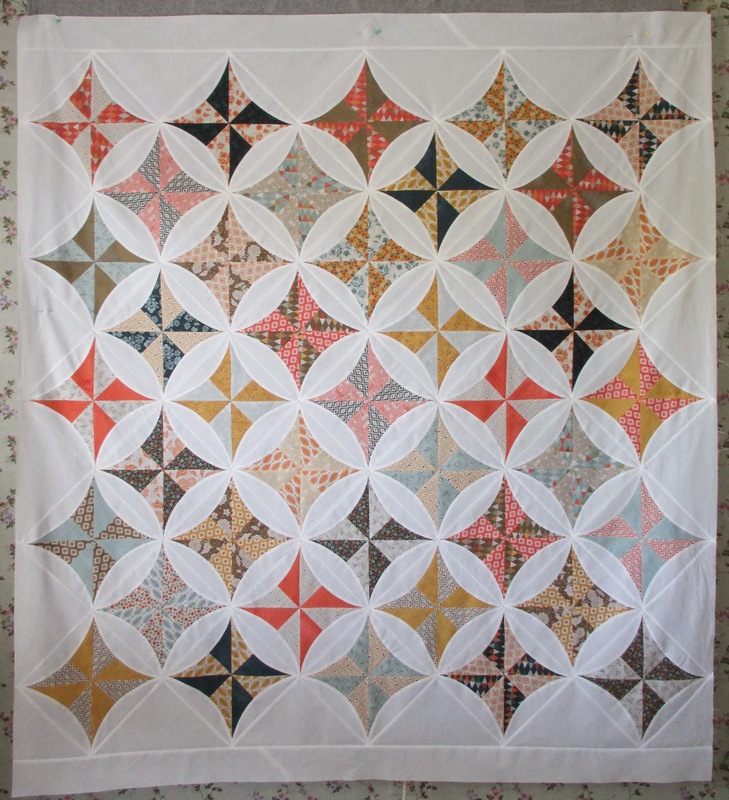 The finishes had approximately 21,234 pieces and combined would make a quilt 1,679" x 1,726" (or 135 feet by 143 feet). I also had some quilting activities outside my sewing room. 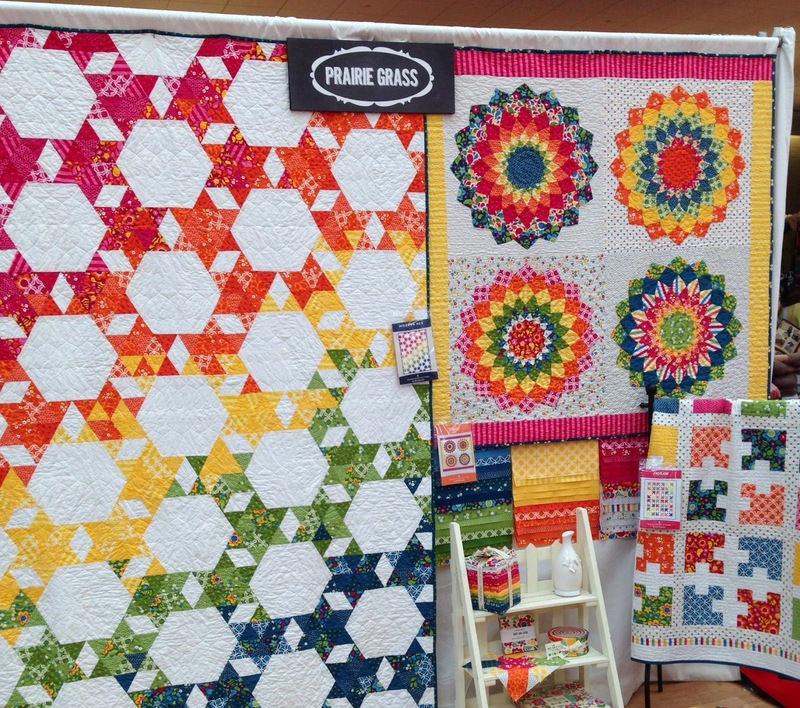 I met two dear friends at the Buggy Barn for their annual quilt show. I thoroughly enjoyed my class with Kim Diehl. The bad news, like so many wonderful brick and mortar quilt shops, they closed immediately following their show. I'm so glad we were able to attend their last hurrah. I was also lucky enough to take a quick peak around Spring Market. But my biggest highlight of 2014 was having Lifetime Quilt # 75, Done Pickin', accepted into the juried AQS show in Paducah, Ky. I am exactly like you, quilting is my hobby, not my job. 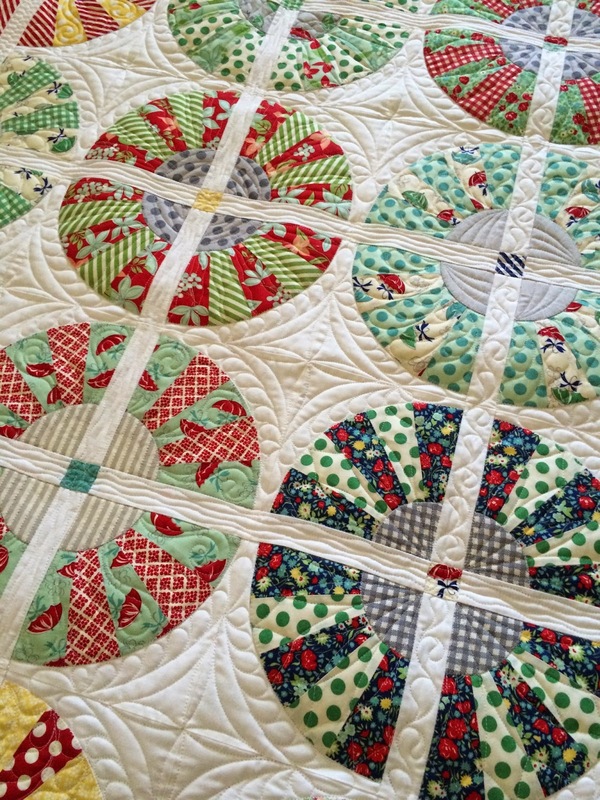 I am not a professional, so it was a huge thrill when I was notified that my quilt was in. Well the show was an even bigger thrill when we found out that it won an honorable mention. 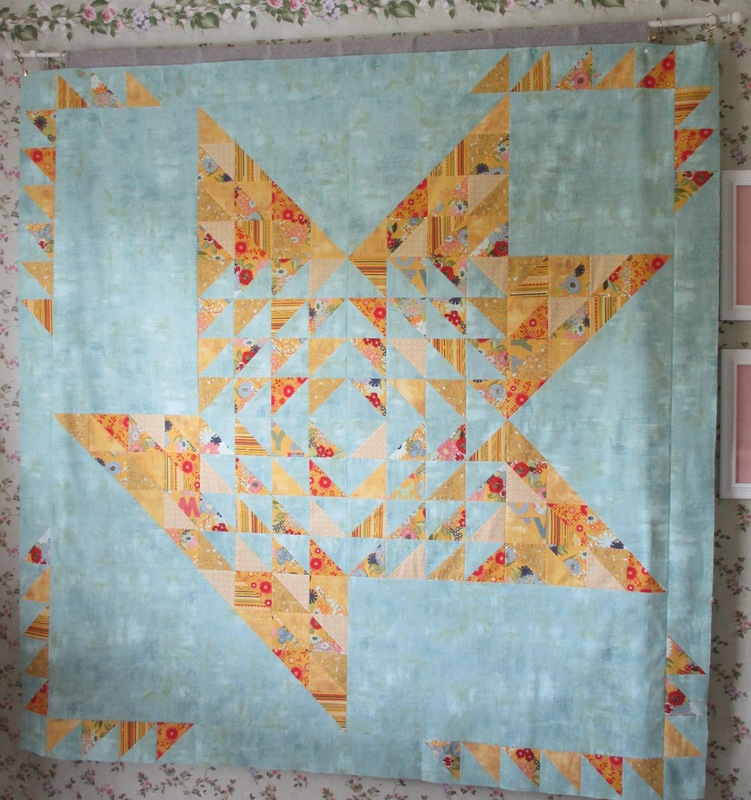 The quilt was expertly quilted by Linda Hrcka of the Quilted Pineapple. Linda and I attended the awards ceremony together and cried like babies when we got the news. Here I am with the quilt at the show, and with Linda, and Lisa Bongean, who designed the pattern, officially called Door County Cherry Baskets. It was a night I'll never forget. Even now, as I write about it, it puts a smile on my face, and sharing the experience with a friend made it all the sweeter. 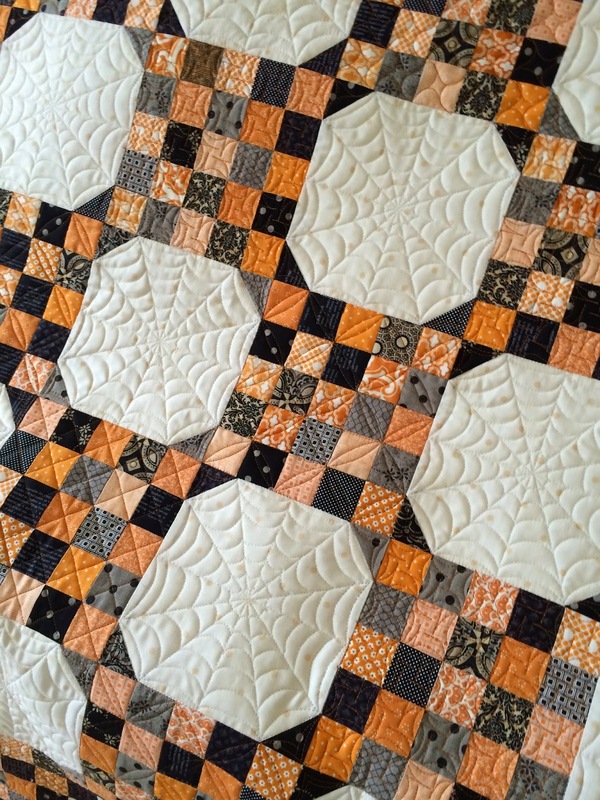 2014 was a very rewarding and fun quilting year, I hope I am as fortunate next year. I'll talk about my 2015 goals in my next post. 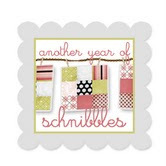 Best wishes to you for a wonderful 2015 sewing year, I hope you continue to keep me posted on what you're working on and have time to stop by and see what I'm up to, I'm so appreciative to belong to such a supportive and friendly community, thank you for being a part of it. Once I finished Christmas Garden Lattice I was still in the mood to work on a Christmas project, but what to do, my stash is currently limited to Kate Spain Christmas fabric. I admired a few "Spell it with Moda" projects using Christmas words and decided to give that a try. I did have some red reindeer yardage from a Primitive Gatherings line in my red stash so I decided to make a red and white Christmas word quilt. I also decided to shrink the Moda alphabet blocks down by half. This was my first word. Unfortunately I didn't feel any joy for my "joy" word. Too many red and white quilts in my past I guess. But I did like the idea so instead I just pulled Christmas colors from my regular stash and came up with this. I wish I would have stumbled across this idea sooner. One word a day the month of December would be a fun month. Once Christmas is over I'm guessing I'll be out of the mood to work on this project and since I have finished my one new Christmas quilt for this year, I'm considering this a jump start on next December's project. I plan to have maybe 13 rows of words separated by star and tree blocks. At our house we enjoy Christmas Eve as much or more as Christmas day, it's the perfect combination of having everything done and the anticipation of what is to come, we call it a very magical day. I hope you and your family have a very magical day too. Best wishes friends for a wonderful and safe holiday season. I've finished piecing Garden Lattice. Picking out my fabric sets was harder than piecing the blocks. The pattern called for 35 blocks, 7 rows of 5 blocks, I'm working through a square quilt phase so I made 25 blocks, 5 rows of 5 blocks. The fabric is all Kate Spain for Moda, different families from my stash. It finished at 64 1/2" x 64 1/2"
It has approximately 457 pieces. I thoroughly enjoyed working on this pattern. The fabric added to my Christmas spirit while the simple directions didn't add to my Christmas stress. I think this pattern would work for any style of fabric and could be a great stash buster, keep it in mind as you plan your projects for 2015. 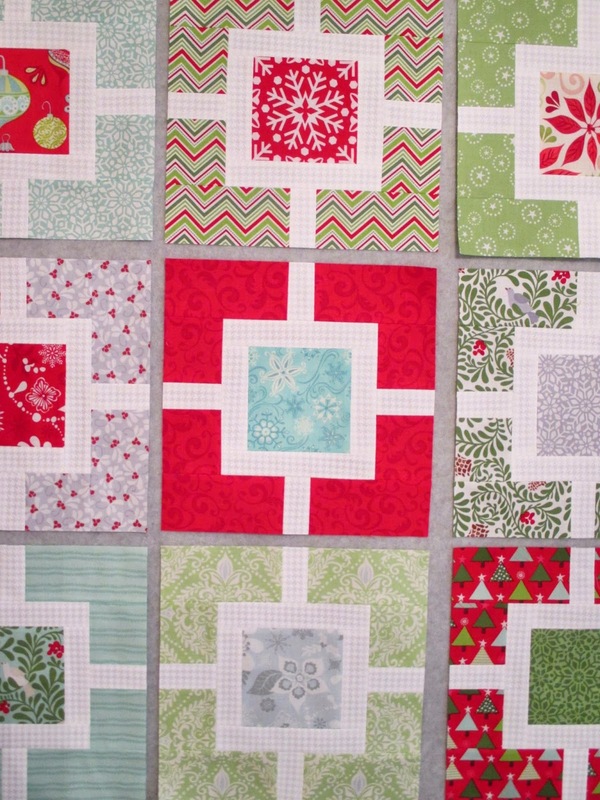 It's December, so that means I'm sewing another Christmas quilt. This is the month I usually sew my Christmas quilts. Last December I made a Christmas Round and Round and the year before that I made Vintage Holiday. While I'm sewing my Christmas quilts I also listen to Christmas music or watch old Christmas movies on TV, it really is the most wonderful time of the year!! I don't have much in the way of Christmas fabric, it is usually released in July, and I'm not in the mood to buy Christmas fabric in July. I do however always buy whatever Kate Spain designs for Christmas so that is what I have to work with, her Solstice line and some scraps from prior year lines. So I spread all my fabric all over my sewing table hoping that would help me decide on a pattern. And several good ones crossed my mind, Seven Letters, Cheerio, and Norway are tops on my current To Do list. But then I decided to go with a pattern from Cindy Lammon's book, Simply Modern Christmas. This book has several patterns that I like, patterns that would work for Christmas or any time of year and any style of fabric. If you don't have this book,you can look at all the patterns on Amazon, click here. I decided to go with the Garden Lattice pattern because I think the blocks look like presents. 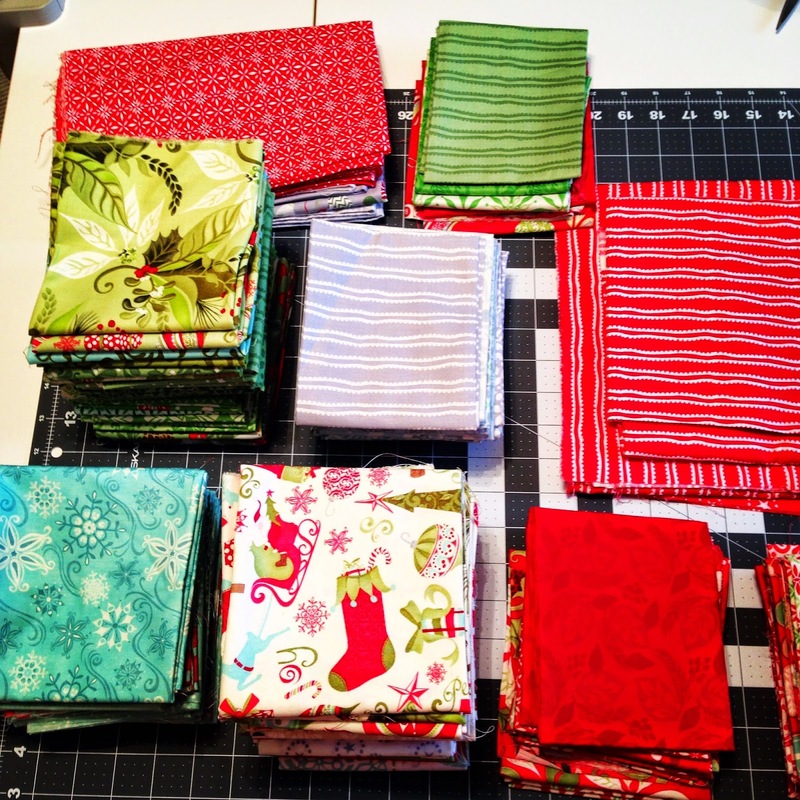 As a matter of fact, Cindy's version doesn't even use traditional Christmas fabric, she just went with an assortment of red and green fabric from her stash. And here are my Garden Lattice present blocks. The pattern calls for 35 blocks, I'm not sure how many I'll make, but right now, I'm enjoying making every block and can't begin to pick a favorite. Ah December, I love this month. I hope you're able to squeeze in some sewing time this time of year! I've been doing the normal December activities, like shopping and decorating, plus I've had a little time to sew. Every now and then I've been piecing Red Letter Day blocks. The blocks are huge, over 22 inches, and they go together easily. Before I knew it I had pieced a whole wall of Red Letter Day blocks. I made a few extra to cover my brother's king size bed. The fabric is by Sandy Gervais for Moda, a mixture of a couple of her fall lines. It's currently 90 1/2 inches square and has approximately 1,168 pieces. I've been getting my Christmas quilts out, if the sun ever shines I'll take and share a few pictures. I've decided you can't have too many Christmas quilts and plan to spend the rest of this month working on another one. Currently I have no plans other than the them, Christmas. I hope your decorating and shopping are going well and that you're able to squeeze in a little sewing too!